The Golden Age of Churning has ended. Earlier this month, I reported that Chase has affectively removed themselves from the churning game. Back in 2014, AMEX began limiting their sign-ups on personal cards as once per lifetime. Business cards, were safe, but it was only a matter of time when this would carry over to business cards. If this sounds familiar, that’s because it should. Today AMEX changed the terms & conditions to exclude churners on business card products as well: business cards are now once per lifetime. These offers come and go, but keep an eye out for their high offers as you’re now limited. So much doom and gloom. This is not sustainable for banks like AMEX and Chase and they’ll walk back and soften some of their rules. We will continue to get creative to find work arounds to keep earning miles and flying on pennies to the dollar, but the Golden Age is over. 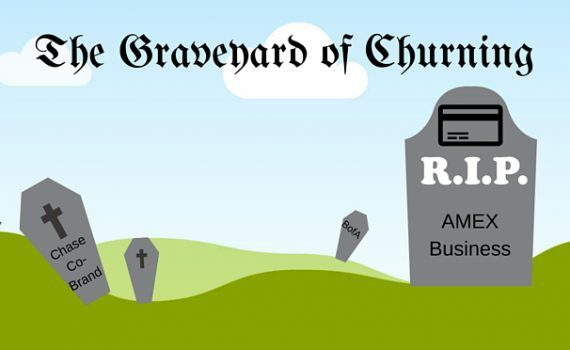 AMEX had a bad year: they lost Costco, jetBlue and will probably lose the Starwood Preferred Guest credit card portfolio, yet their financial analysts determined that they were losing money off of churners. Chase, the big daddy of credit card rewards, recently re-upped their contracts with United and Southwest. It costs a lot of money for banks to acquire customers (customer acquisition) and every time we open and close cards, earn the bonus, etc., they are paying that cost. Over and over. AMEX has had this rule since 2014. Chase’s 5/24 rule started in May 2015. It’s still to early for Chase and AMEX to determine, quantitatively, whether or not these new rules are having an adverse affect. Some bloggers have stated that this is not sustainable for the airlines–as the banks have quotas to fill. Sure, they have quotas, but they’re acquiring new customers all the time. I’ll admit, it’s a little dramatic, but it’s really to highlight that we all need to get creative and use our points in the most effective ways possible. Use your miles for gift cards and merchandise? Probably not. Maximize every purchase for the greatest return? Definitely. Branch (pun intended) out to other banks. Barclays and Citi both have solid portfolios and are competing heavily to be in the rewards space. Bank of America has some good cards too. Moving forward, you should still go for those Chase cards first. After you’ve gotten five, go for AMEX like you’d have done anyways, just be smart about applying when the sign-up is at its highest. And I do hope that either Chase or AMEX soften their rules, just a bit.